"This favorite technique of mine was started by the Romans and perfected on the island of Murano during the Renaissance. 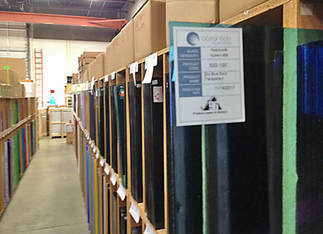 Colored glass is encased by clear glass and drawn down to coarse lines by stretching the hot glass. 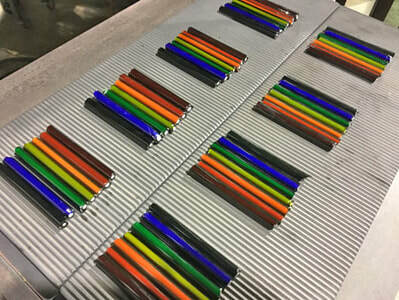 These cooled rods of colored glass lines are cut to size and reheated. 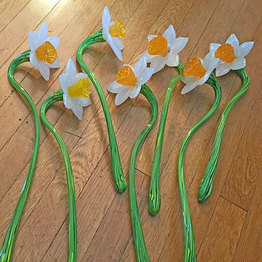 The rods are combined with molten glass and drawn down a 2nd time by stretching. 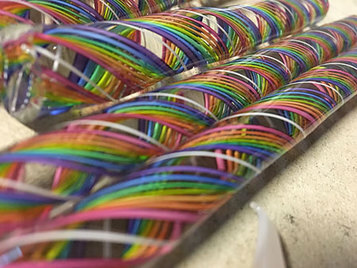 During this 2nd stretching, the glass is twisted to created a helix of fine colored lines. 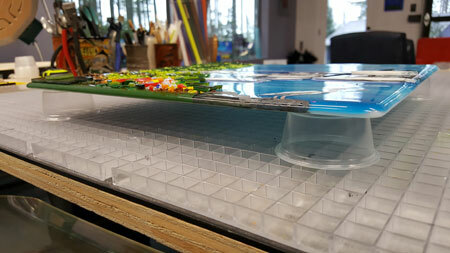 "Want to contain the flow of a thick glass piece? Use a tile saw to cut an old kiln shelf into strips. Give them a good coat of kiln wash and set them in a pinwheel pattern around your piece. If you set them about 2mm away from the glass on all sides you'll get a beautiful, clean fired edge - no cold working!" 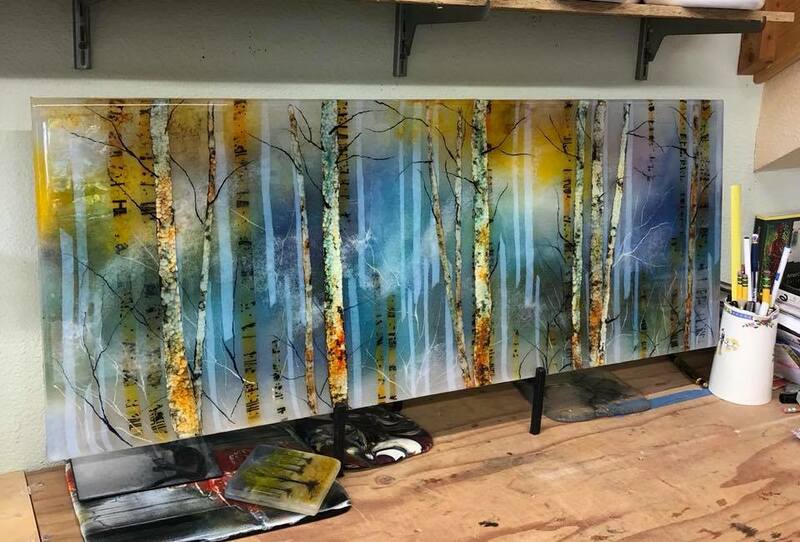 Fred Buxton, who teaches at his Raining Sunshine Studio in Port Orchard, recommends using plastic condiment cups to elevate the base glass when constructing a piece. 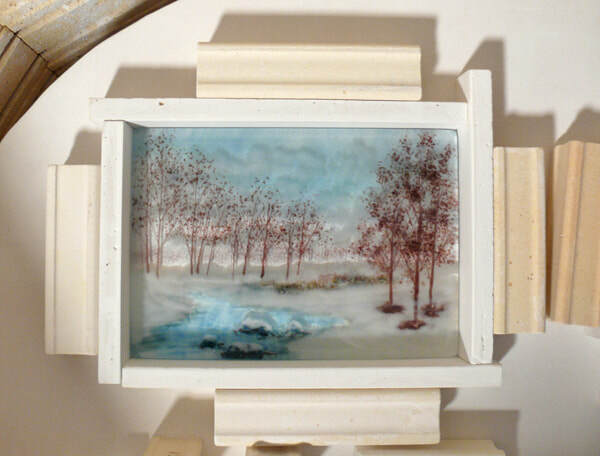 This makes it easier to pick up the piece and transport it to the kiln. They stack well so they get out of your way when not in use. 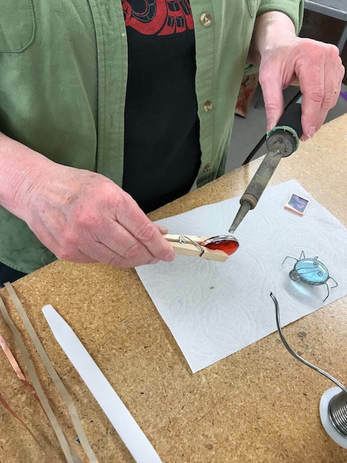 Lael Bennett, instructor at Glass Expressions, shares that a convenient way to hold small pieces while soldering the edge is an old-fashioned wooden clothespin. It will keep your hands away from hot solder. It also holds small pieces upright while attaching rings. 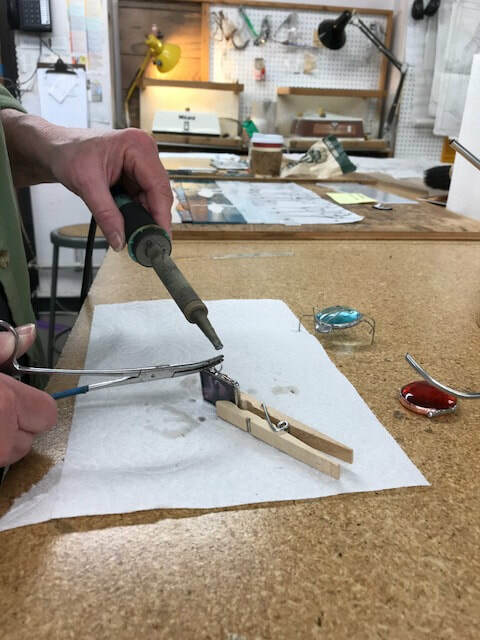 Robyn Johnson at Covenant Art Glass says she loves using Hakko Soldering Iron Tip Cleaner instead of Sal Ammoniac to clean and maintain her soldering iron tips. 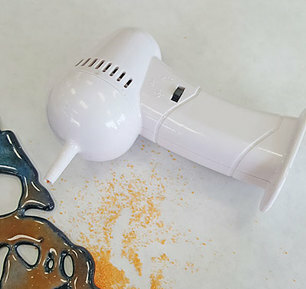 She also recommends using the "As seen on TV - Ear Wax Cleaner", a small vacuum (under $6.00) to clean up loose frit (Powder, Fine and Medium) off the kiln shelf before firing projects. From Matt Laitala at NW Art Glass: "People often wonder why their patina finish is not as dark and even as others they have seen or ask why their solder corrodes and oxidizes. The answer is often the same - they went cheap on the finish. 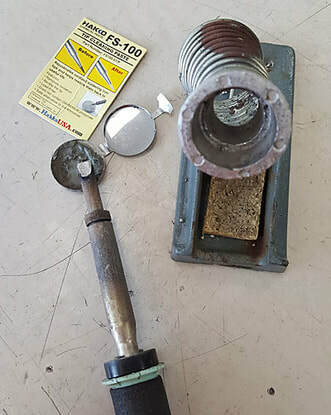 Clean your soldered piece of glass art with a flux neutralizer like CJ's Flux Remover and your patina will apply much darker and much more even. 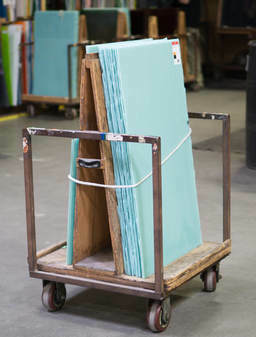 Seal the finished piece with Clarity Finishing Compound and the entire project will be oxidation and mildew resistant!" (See coupon below for discount on these brands of finishing chemicals). Also note that NW Art Glass has all of their books on sale at the moment. Books are another great source of tips and tricks. Bullseye Glass Company's print section and video section are strong and still growing. Many tips are free. I still find the subscription videos well worth the $45 annual fee -- KS. Oceanside System 96 (the old Spectrum) info is found here. Wissmach glass also has some free info. Taking a class or going to glass events like art shows, studio tours etc. and asking the artist questions is one of the best ways to pick up all those little tips that make things easier (many of our usual contributors have just come back from the annual glass convention in Las Vegas). Chris Steffens just pulled these out of the annealer. 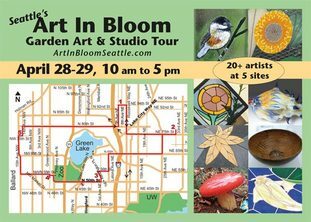 He and several other glass blowers will be at site #5 of the ArtInBloomSeattle.com garden art & studio tour. Bullseye Glass Company has just come out with their next catalog. It includes this Robin's Egg Blue and several other new blues and greens. Your usual Bullseye Glass supplier should have the new glass in stock now. Photo: Oceanside System 96 in stock at NW Art Glass. 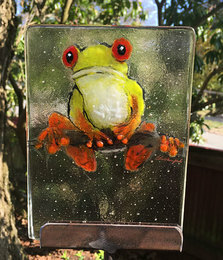 Other suppliers I checked with (Roses Glassworks in Portland, Covenant Art Glass in Everett and Glass Expressions in Burien) report having some on hand and are looking forward to receiving more soon. Check with your favorite local supplier. 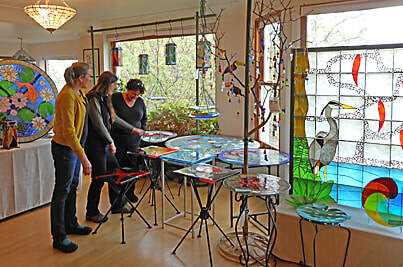 You sell/teach glass art and you're not in our Gallery? It's free. 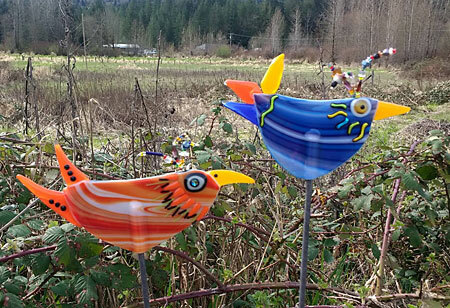 Without you and your other glass friends our database isn't nearly as useful to the the Pacific NW glass community. We want a photo of yourself at work for the artist directory and 3 images of your art for the gallery plus a bit more info so prospective buyers, galleries, students etc. can contact you. Get your name and link in front of more than 250 local potential glass customers/students. It only costs you the 10% if it's effective and you sell something (the 10% goes to your customer, not FIG). FIG is free and all volunteer: the coupon is how we get folks to subscribe and open the newsletter. Thank you to all those who have supported us in this way!